It is normal for the month or so before JavaOne to be filled with demo building fun but up until now that had only included software development and visual design. This year we had been working with small embedded devices such as the Beagle XM, Panda ES and Raspberry Pi. As cool as they are they come as bare board which is neither practical or compelling for demos. So this year I took on the challenge of designing and building the hardware for the demo as well as software and visual design. 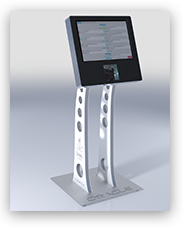 We already had the idea of using the JavaOne schedule data set for a demo and the crazy idea of building kiosks popped up one time when we were chatting about how to use the data. The initial designs seriously seems mindblowing. JavaFX is really rocking and would soon take over. 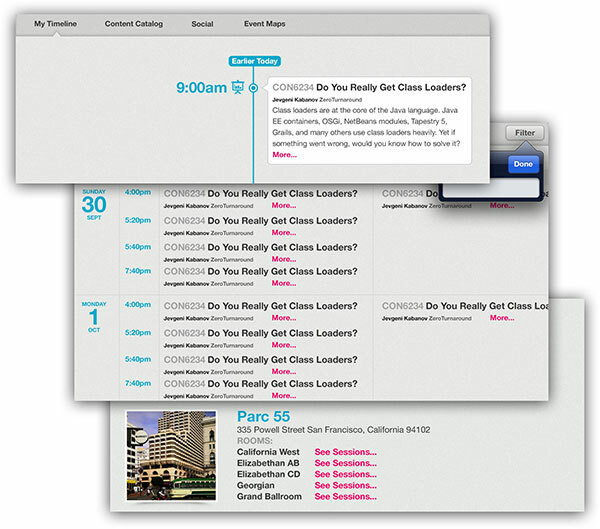 The UI looks great and would love to read further about the prototype story. By the way which hardware was used to build the prototype out of the three mentioned above ? Where did you get the embedded port of JavaFX !? You can get the first early access of JavaFX for ARM at http://jdk7.java.net/fxarmpreview/javafx-arm-developer-preview.html designed for Beagle xM board. fantastic ui!! Do you think to release the source of the code?I think it would be interesting to study. The ui looks great. I wanted to dive into JavaFX recently, but the Java SE license terms ( http://www.oracle.com/technetwork/java/javase/terms/license/index.html ) do not cover kiosk systems explicitly. You used an ARM edition of JavaFX. That edition is currently at preview status and it’s license ( http://jdk7.java.net/license.html ) grants non-commercial and non-productive use only. Is there any way to use JavaFX in a real world application from a licensing point of view? I even could not find alternative licenses on the Oracle web shop. Do have insights on licenses and future evolvement? Oracle’s Binary Code License for Java SE (and JavaFX) enables it to be freely used for general purpose desktops or servers. However if Java SE (or JavaFX) is bundled as part of a dedicated solution that involves or controls hardware of some kind, then it’s likely an embedded application and is subject to modest royalty payments. Nice work! I am trying to watch the presentation “CON4606 – Building Amazing Applications with JavaFX” from javaone but unfortunately the video and the presentation were removed from the session page, can you please essist ? I am doing a technology research how to get a gui for an audio mixing console on an arm-board with multi-touch screen. JavaFX for ARM seems to be suited well. Can you advise me which device (Beagle XM, Panda ES, Raspberry Pi or any other eval board) is best for getting a fast result. Also, I am looking for a supported multi-touch screen. Would any linux-compaible multi-touch work? Or can you suggest any? So this post will not get a part 2 before Javaone 2013 this year. Assumming part 2 will have source codes. This is real JavaFX evangelism! Please Oracle learn from this http://code.google.com/p/iosched/. BTW please inform the JavaOne speakers if they are not making source codes available they should not even demo the app. We are not following these events to be entertained but to learn. hey, how can i make the tabpane in javafx positioned on the left but the text still horizontal and add some image in it?? please!